The mailbox held a surprise a couple of days ago…a wonderful gift from Steph in Belgium. Look at the hand decorated envelope. Both sides were completely covered! There was a cool silver wire ring and some beads that will find a home on a new necklace soon. Thanks so much Steph for brightening my day. Here are three new necklaces that I just completed. I have been into hearts and wire lacing and stitching lately. And finally a little of playing around. This angel was made from a styrofoam tray that I had used as a palette, a crushed bottle cap found in a parking lot, magazine letters, and an old paintbrush. All is pretty peaceful at Stillwaters farm this week. The company (7 wonderful family members) of last week has gone home, The puppy is now happy and playing outside again with our grandpuppy Grant whom we are puppy-sitting. I hope to get back to some semblance of a routine this week and do some creating. Here one of the pieces that I managed to do last week. Well…this has been an interesting week. I had to take Maggie to be spayed on Monday. She couldn’t have anything to eat or drink so I had to keep her in the house all day until I kept took her in. A couple of my friends were coming out to fish in our pond and when they arrived they had about 10 other people with them to fish and then they were going to fry the fish here and eat them. I love my friend and it ordinarily would have been no problem at all but the dog was stressing me out. She does not like being in the house and is not house broken. All day, I had to keep saying, “Don’t let the dog out and don’t feed her.” Finally I got to take her to town and got her safely home that evening. We have to keep her in the house while she heals, but on Thursday I put her on a rope so she could hang out outside for a little while and not get into trouble. The main problem with letting her outside is that she is not supposed to get in the pond because she mustn’t get her incision wet. She apparently got bored and started picking at her stitches and got them to open a little and the area got swollen, so I had to take her to town to the vet and they gave her an E collar and some antibiotics. She is sooooo bored in the house. I’ve been trying to spend as much time in the basement with her as I can, but I can’t stay down there all the time. Also on Thursday I had two of my nieces here to have an art day with Aunt Sherry. We had a great time making baskets and jewelry and then I discovered I had to make the emergency visit to the vet, so I left them with my husband. He was thinking, “How can I entertain two little girls?” No problem…they wanted to go fishing, so he was happy to take them. When I got home they were playing pool and talking about how many fish they had caught. Happy ending for the day except for the unhappy dog in the collar. Yesterday I took them with me to my friend Shawn’s house to pick up my jewelry left over from her sale the previous day. It was like an art field trip for them to visit another artist’s studio. Today I get to stay home and rest with my puppy all day. Whew! A welcome bit of peace. I just got to spend a glorious week with my older son and his wife and on last weekend and this weekend my other son and his wife were here too. It is so good to spend time with them. They make life more interesting. Last weekend we were celebrating my DH’s birthday and I did a new painting for his office but forgot to take a picture of it. I’ll try to remember to do that this week so that I can post it. Saturday night we officially kicked off summer by going to the local drive-in theater. We saw the new Indiana Jones movie. It was pretty fun except we missed about the last 10 minutes because the electricity went off. Now it’s time to get back to work. 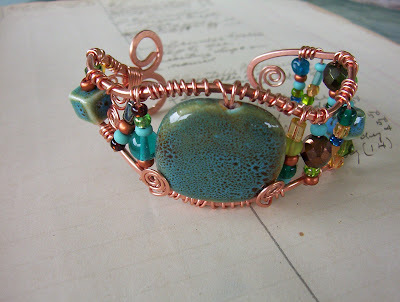 I did manage to do a few pieces of jewelry last week, but I have to put my nose to the grindstone now. Here are a few of the pieces that I’ve completed.